Poor Stacey. She just moved to a new town, is still coming to terms with her diabetes, and is facing baby-sitting problems left and right. Fortunately, Stacey has three new friends — Kristy, Claudia, and Mary Anne. Together they’re the BSC — and they will deal with whatever’s thrown their way… even if it’s a rival baby-sitting club! Stacey was very secretive in the first volume, because she feared if she told her friends that she was diabetic, they would suddenly stop talking to her like her best friend back in New York did. Obviously she was wrong to believe that, but she did tell the Baby-Sitters Club the truth in the end and everyone accepted her. In this volume, we get a glimpse of her past and her family life. We are able to understand her everyday life better and what it means for her to be diabetic. But this volume does not only focus on Stacey. 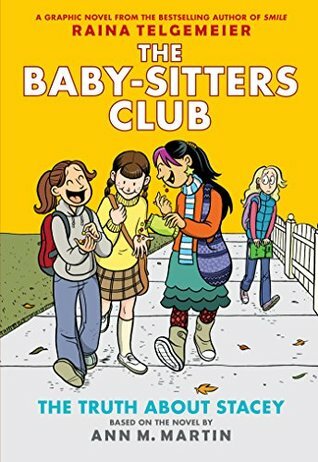 She may be the main character, but the main subject concerns all Baby-Sitters Club members. Indeed, the club may be in danger of losing all of its customers, seeing that there is a new club in town. This club has something Stacey’s does not: older members. However, the girls will realize that it’s not because someone is older that they are more responsible. They will also have to find a way to save their club which means everything to them. It brings them together like nothing else does. I enjoyed this volume much more than the previous one. The Baby-Sitters Club members are able to understand more about life and friendship with every new chapters that appears. It was a blast.